Donovan Knowles on the shavehorse. 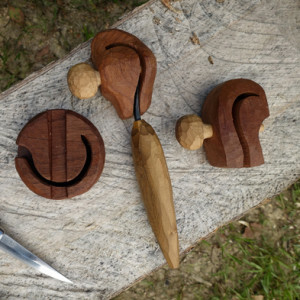 The world doesn’t really need more spoons, but as an exercise in creative wood sculpting and as an opportunity for wood play, these small objects are a microcosm of how and how not to work wood. Why are legions of people gravitating to this niche craft? There’s a tradition, but most aren’t really in touch with that. There’s utility and function, but that’s not the reason either. ‘Homey’ and yet arty, spoons are small enough to get close to as you appreciate their smoothness or facets. Most attractive about this craft is the fact you don’t need many tools, not even a workbench, vice or a workshop to get started. It can be a solitary or a social pursuit. The result can be primitive or rustic, elegant or quirky, through to sublimely smooth and flowing. All styles have merit and interestingly all makers seem to quickly develop their own. And remember you can’t fail with a spoon. Every slip of the knife provides another ‘design opportunity’ to morph that thing and give it a new and proud identity. Spoons can become spatulas, stirrers, and even one-holed strainers. Handles can get shorter, thinner and whoops…now it’s a scoop. 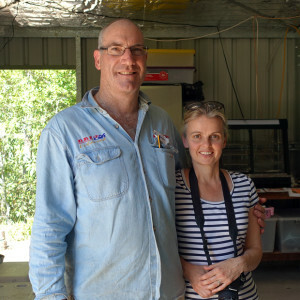 Last weekend’s Spoonies in the Tweed was a gathering of around 20 people who enjoyed the hospitality of Graham and Carolyn Folland, pictured below, who host the event on their beautiful Uki, NSW property. A big green shed is the hub with its central kitchen, eating and hanging out space. Carving took place in a nearby marquee, and in between there was an outdoor campfire spot for Saturday night pizza and beers. 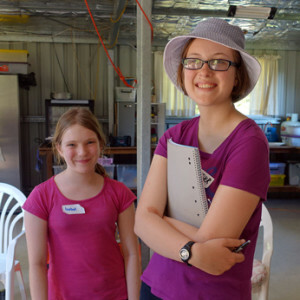 The Spoonies team included Graham and Carolyn's daughter Isabel (left in the photo below) and her friend Heather. They helped to make the event run smoothly...and just plain fun. 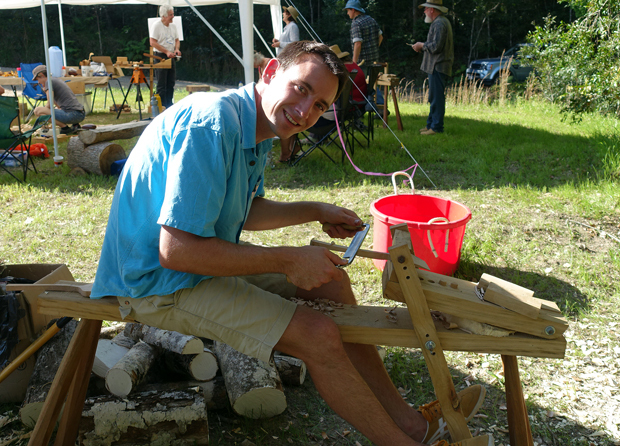 The other main attraction of Spoonies is learning from Robert (Bob) Howard who truly is a master woodcarver and woodworker, and also a longstanding contributing editor to Australian Wood Review. Bob's teaching style is instructive and engaging with lots of special insider tips. For the whole weekend Bob was on hand, moving around chatting to each participant, suggesting various tools and how to use them. On Saturday morning, at the start of the event, Bob welcomed everyone and gave a talk on safety. He went on to talk about spoon design using examples of his own work. 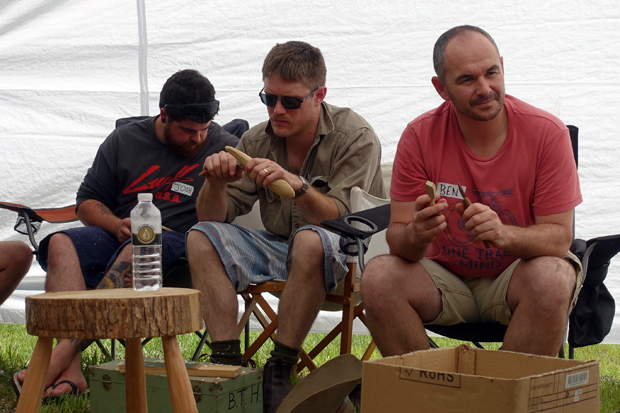 Once Bob’s talk was over weapons and blanks were selected and so it began. Becoming aquainted with the tops of each others’ heads was a feature of the weekend. It was hard to get shots of people's faces I’m afraid! Josh, Mike and Ben were sensible and brought their own camp chairs. As former students of Bob, Mike and Ben showed their skill early on. 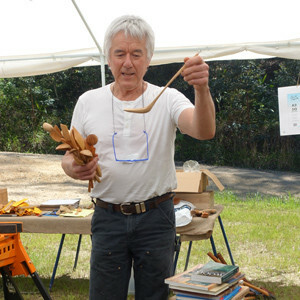 Below: As introductory exercises Bob brought along some radiata pine blanks. There were multiples of five or so shapes that would provide learning opportunities for those new to the game. 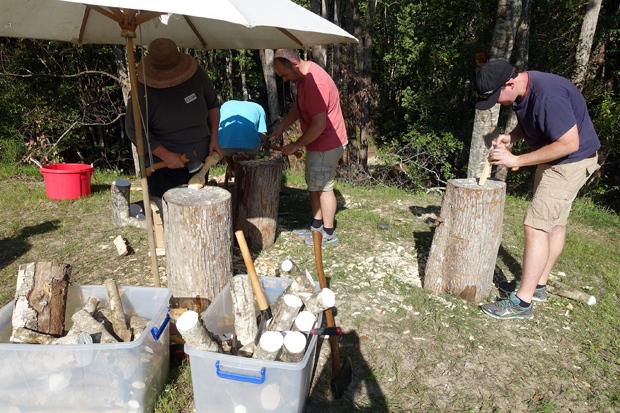 On the right are sawn and end-sealed sections of privet that Bob also brought along for green woodcarving. 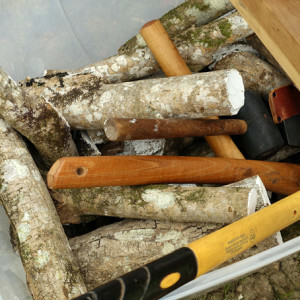 Above: Green wood is split and then shaped with an axe. 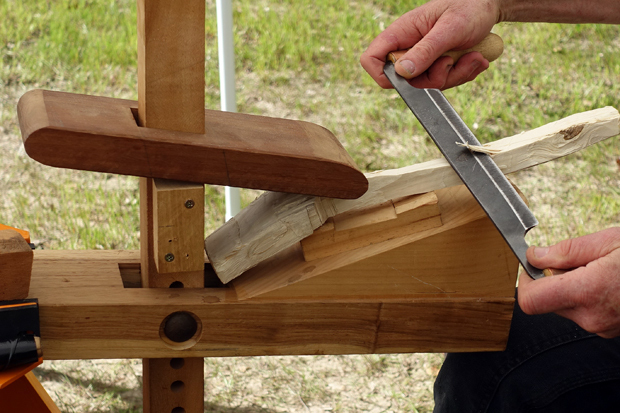 Used on wood, especially green wood, as shown here in the shavehorse, the drawknife removes material rapidly. Sam Johnson on the shavehorse. Even with all the expensive tools in the world you’ve got nothing if you can’t sharpen them. 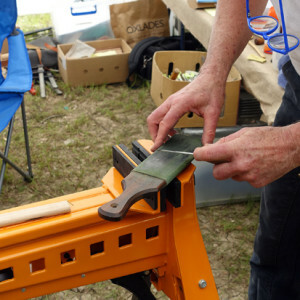 Later on in the afternoon, complete with a big white notepad for drawings and diagrams, Bob Howard gave a big talk and demo on ways and means to get an edge on hooked tools and beveled knife blades. 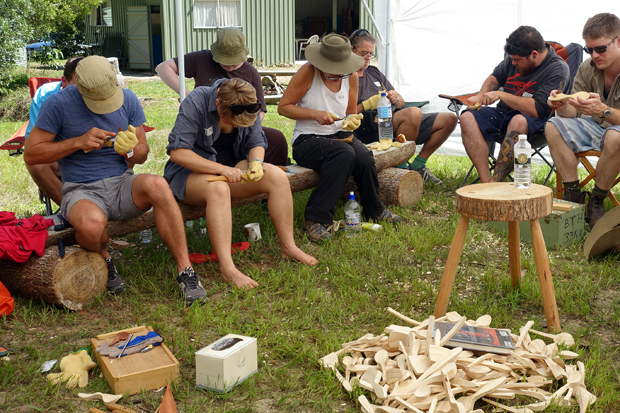 Weekend spoonaphiles were presented with their own pair of shaped wooden strips that they could take home and wrap grades of wet and dry around and use to sharpen. 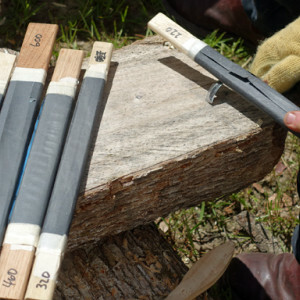 Frequent honing, as shown above, is the key however to minimising the need for sharpening. 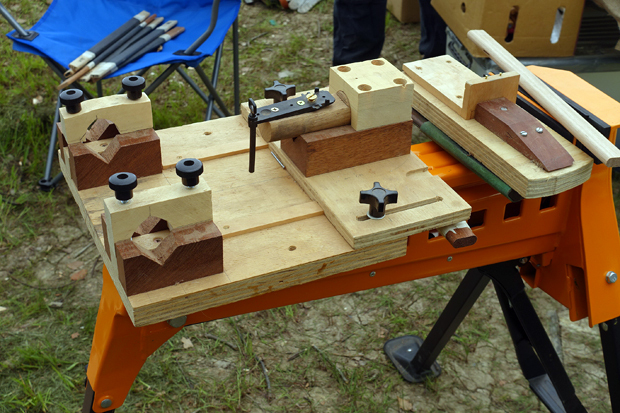 Above: Bob's custom made spoon tool sharpening jig impressed everyone with its functionality. 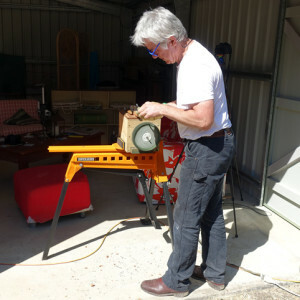 On Sunday morning Bob took all his tools over to the shed and fired up his home-made buffing wheel. An old washing machine motor is all it takes to turn a felt wheel in either direction. You just need to make sure small radius hooked tools don't catch as they could fly off! More of Bob's ingenuity is shown above right. Only Bob could carve these sculptural custom fitted blade guards. They work a bit like chastity belts to keep those blades out of harm's way. 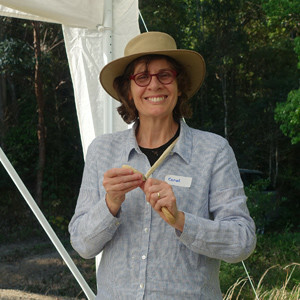 The lovely Carol Russell, herself a master of spoon carving also came along and was on hand to lend support to those new to the art. 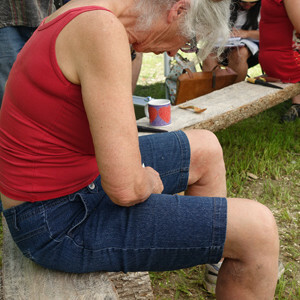 Below: Sue (left) from Brisbane and Laura from Coonabarabran were hard at it the whole time. There was also a ceremonial aspect to Spoonies, and an end-of-event awards presentation recognised talent within the crew. 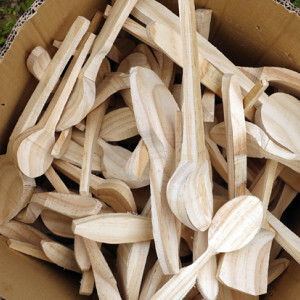 Below is shown the gallery of spoons that grew throughout the weekend. 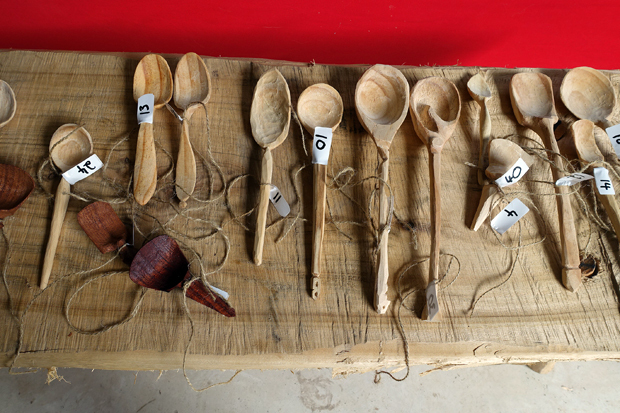 As each new model was completed, participants rushed off to have them tagged, documented and displayed for the climactic spoon judging. The final judging took longer than expected, apparently it was a close call for the judges. But finally, as you can see below, the results were announced. 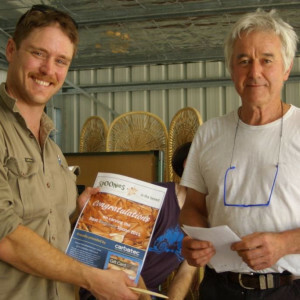 Sam Johnson (shown above) and Kieran Schulz were pronounced joint beginner winners, while Barton Chesworth took out the 'Artisan's Challenge' as well as an award for creativity. 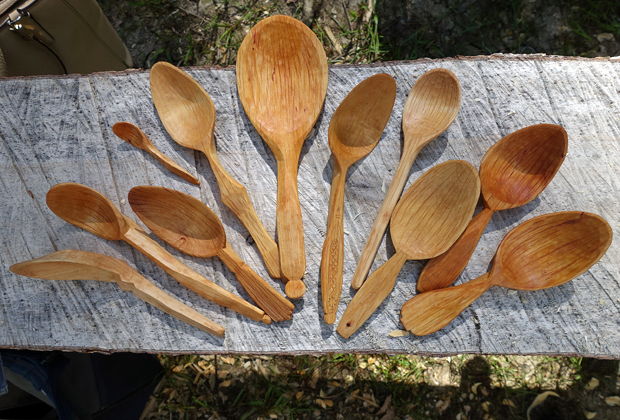 Barton brought along some of his spoons and they were indeed beauties as you can see below. 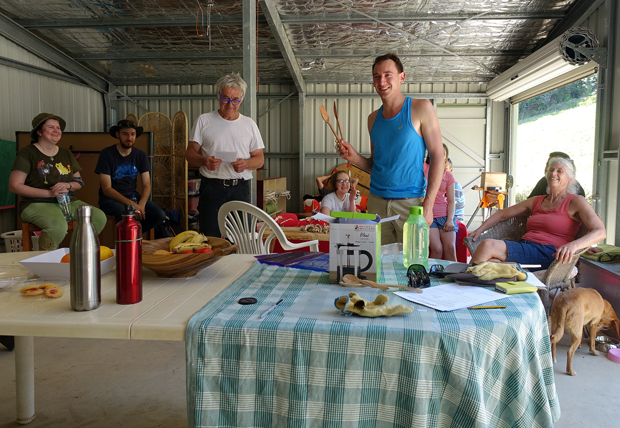 'Best spoon overall' was won by Mike Fleming! The photo below of Mike and Bob below was taken by Carolyn Folland. Adding to the fun were some vouchers sponsored by Carbatec that were happily received. 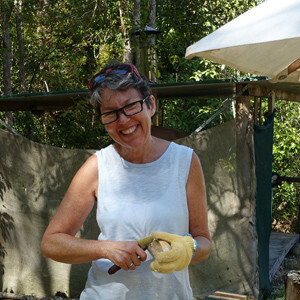 And a few Wood Review mags were handed out to Laura Hartley, Steve Allen and David Ennew, acknowledging showing creative flair in their first spoonmaking venture. Well, this is quite a lengthy wrap-up, so if you've hung on this far, the only thing left to say is that attending next year's event is highly recommmended.